On February 18th the Western Conference Champions San Antonio Spurs come to the Staples Center to take on the LA Clippers at 7:30pm pst. 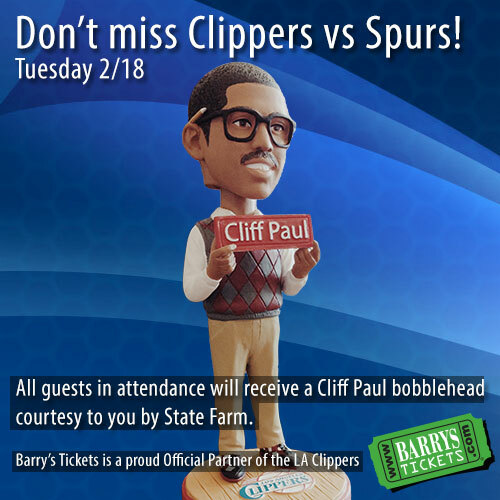 The Clippers will be giving out a Cliff Paul Bobblehead to all in attendance and now is your chance to win a Pair of Clippers Vs Spurs Tickets, two LA Clippers and Barry’s Tickets T-Shirts and two Cliff Paul Bobbleheads! ARE YOU A CHRIS PAUL FAN? 2) Upload a picture of yourself with a Chris Paul or Cliff Paul merchandise related item (examples: shirt, jersey, hoodie, holding a bobblehead etc) but it must be you in the picture with the item. 3) Use Hashtag #WINCP3TIX to enter! You can enter our Cliff Paul Bobblehead Giveaway night contest via Twitter, Facebook, Google+ or Instagram. Your social media profile cannot be locked because we need to be able to verify that it is you in the picture. If we can not verify that the picture is of you, then your entry will automatically be disqualified. Once again, your picture must include yourself with a Chris Paul or Cliff Paul merchandise item. On February 11th Barry’s Tickets will have a random drawing of all eligible entries and ONE winner will be chosen. There will only be ONE WINNER Randomly Chosen total for this contest. By entering this contest you agree to all Barry’s Tickets Contest Rules. Barry’s Tickets reserves the right to cancel or change any contest, promotion or giveaway. Barry’s Tickets is an Official Partner of the Los Angeles Clippers. Barry’s Ticket is not responsible if the winner does not receive a bobblehead at the Spurs Vs Clippers game on Feb 18th Staples Center. You can purchase Clippers Tickets for all games! Monday night’s heavyweight Western Conference bout ending in a surprising manner, as the LA Clippers beat the Oklahoma City Thunder, 92-77. The game locked up Lob City’s postseason bid, marking the first time the Clippers have made the playoffs since 2006. Los Angeles was lead by Blake Griffin who had 17 points and 11 rebounds but got some serious support from Nick Young off the bench who went for 19 points on 7-of-10 shooting and 3-of-4 from downtown. The real turning point in the game came in the 3rd quarter where L.A. topped Oklahoma 23 to 14. Durant mustered 24 points, but James Hardin only had 12 while Russell Westbrook only managed nine points to go along with five turnovers. The L.A. faithful were in attendance to celebrate their playoff qualifying night as the franchise enjoyed their 32nd consecutive sellout crowd. There was a time, for example, the bulk of the team’s existence that was merely making the NBA playoffs would have been the most a Clippers fan would dare to expect from a team that has finished with a record above. The Clippers’ 2005-06 playoff appearance represents the only time they’ve won a playoff series while playing in Los Angeles, and even then they didn’t get beyond the second round. The playoff berth was actually sealed in the first half when the Houston Rockets lost to the Denver Nuggets, but give the Clippers some style points for the win over the Thunder. The Clippers rank first in the league in points per possession (PPP) on shots the ballhandler takes in the pick-and-roll, while Paul ranks sixth among all players. Point being, if Paul gets a favourable switch or the space to operate coming off a screen, he’s one of the best point producers in the league. To properly blow up a pick-and-roll, you need to have mobile, intelligent big men. The Lakers are a perfect example of this. Pau Gasol is one of the best in the business at showing hard on a screen, then recovering properly. He’s a big reason the Lakers rank 9th in pick-and-roll ballhandler defence, even with the molasses-like duo of Derek Fisher and Steve Blake covering the ball most of the year. Although they probably won’t meet in the first round, offensively the Clippers would love a matchup against the San Antonio Spurs, who rank as the league’s worst defensive team in PPP allowed to ballhandlers in the pick-and-roll. The Spurs have immobile bigs and cannot switch their bigs on to guards — a huge reason why the previous meetings between these two teams have been so high scoring. The Denver Nuggets would be another favourable matchup, as they check in at the 20th best team in spot-up PPP, and 23rd in 3-point percentage. However, both the Grizzlies and Nuggets pale in comparison to one of the best matchups for the Clippers and one of the worst shooting teams in the league — the Utah Jazz. The Jazz is 28th in the league in spot-up opportunities and 29th in 3-point shooting at a woeful 30.7 per cent, which is almost ten percentage points lower than the first place Spurs. The Jazz is on the outside looking in at this point, but the Clippers would love to somehow see them in the first round. The NBA playoffs begin April 28. The Clippers will play four of their remaining five games on the road, including visits to Denver, Phoenix and Atlanta before closing out the regular season April 25 in New York. Barrys Ticket is an official partner of the Los Angeles Clippers. We stock all Clippers Playoff Tickets for both home and away games and have the most extensive inventory on the web of Clippers Tickets. Barrys Tickets offers excellent prices as well as excellent service. You can purchase your Clippers Playoff Tickets on the web twenty four hours a day, or visit one of our three Los Angeles Locations including one right next to the Staples Center. Open seven days a week, 10 am – 9 pm, for pickups. Barrys Tickets is your Clippers Playoff headquarters. The NBA announced the cancelation of all regular season games through December 15, 2011.